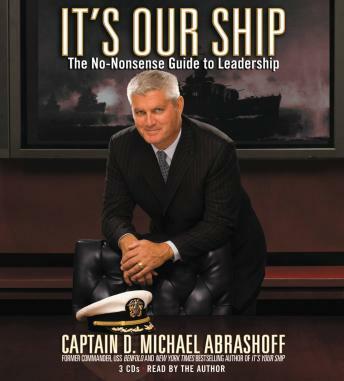 Captain D. Michael Abrashoff, legendary commander of the USS Benfold, continues in the same vein of his bestselling book IT'S YOUR SHIP with the knowledge he's gained from his speaking to and advising some of the top business minds in the world. The story of Captain Abrashoff and his command of USS Benfold has become legendary inside and outside the Navy. By governing his ship with his unique management techniques, Abrashoff turned the Benfold into a model of naval efficiency, with amazing cost savings, the highest gunnery score in the Pacific Fleet, and a highly motivated and top performing crew. In IT'S YOUR SHIP, he first demonstrated how to bring his successful management techniques from the ship to the boardroom. Now, in his newest book IT'S OUR SHIP, in the same rugged, can-do voice, Abrashoff will focus on the leadership, motivational, and management insights and tips that he has learned from his last six years of addressing business and corporate audiences. Abrashoff's timely advice will be eminently prescriptive, and will feature anecdotes and insights from leaders of businesses large and small and from public and non-profit sectors.